It’s been said that first impressions stick. At a job interview, on a date. So why wouldn’t the same go for houses? I’m not talking about curb appeal, although that’s certainly important. What I’m talking about is the first thing you see when you enter a room, actually, even before you enter the room. It’s the door, of course! Instead of sticking with the same old boring wood, why not spruce up the door to add visual interest to the space? Panels that resemble wainscoting or shadow box trim will add dimension and visual interest to a simple door. If the room is decorated with wallpaper, you can go a step further and line the door panel with matching wallpaper to tie the door together with the rest of the room. Paint the door so that it blends in with the walls and unifies the space. 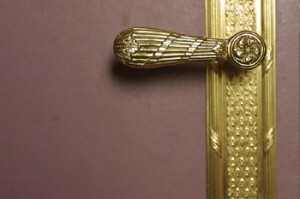 If the walls are lined with chair rail trim, then put matching chair rail trim on the door for a seamless transition. Continuing the wall decor onto the door will help expand the space and create a more open atmosphere. 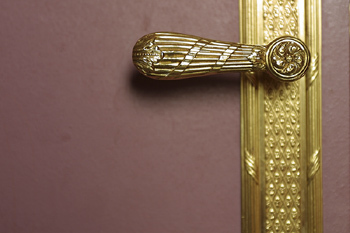 Decorative doorknobs or door panels can transform a boring door into an expression of your personal style. Don’t be afraid to be creative. Use tongue-and-groove paneling strips to infuse a rustic feel into a modern space, or try a glass doorknob for a more sophisticated approach. Letter transfers are a unique option that will set your door apart. Available in a variety of font styles, letter transfers can be used to mark any room in your home. This decorative idea is particularly ideal if you’re big on entertaining, as it will save you the trouble of constantly directing your guests to the powder room. What do you think? Would one or more of these suggestions give your doors added flair? Remember, first impressions matter, and you only get one chance to make them! Great ideas to attract attention and give a house that important polished look from the moment a buyer arrives. Continue inside with details such as trim and molding that provide a final touch for a look of elegance.